I love the vibe at the salon, but I’m just too danged fearful to let anyone deal with my hair unless I’m getting it braided. I mean, I don’t know what products are being used and what’s in those products. I see a lot of IC Fantasia and Keracare, which are probably great for relaxed hair. But for my naps? I don’t know about all of that. I did decide that I was going to throw caution to the wind and let them blow dry and flat iron my hair in April. I don’t know if that’s a good idea. I know that they’ll take care of my hair, but I’m not really that interested in straight hair – especially after dealing with the wig for a week (it felt like a month). Anyway, after Mom was coiffed, we decided to check out Noah’s Natural Foods (667 Yonge Street, check all locations here), at the corner of Charles St. and Yonge St., just south of Bloor St. My mother and I like to investigate and play around with all natural products, especially soaps because we both have very sensitive skin. 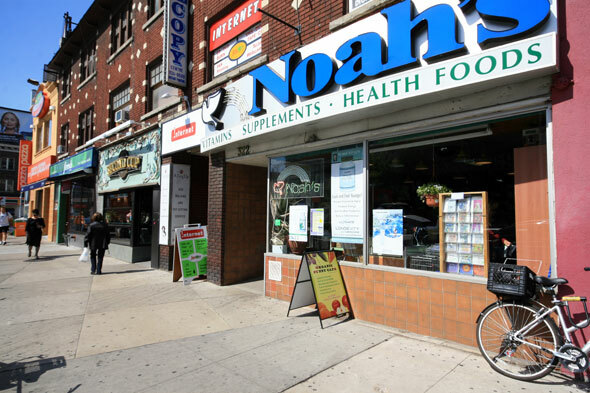 Noah’s is a cornucopia of all things natural and organic. The first time we went, we stayed at the front of the store where all their health and beauty products are. This time, we decided to go further in and see what we could find. And, lemme tell you, there was plenty to find. They have a self-serve herb section where you can you can find all those herbs that you’ve read about that are supposed to be really good for your hair: nettle, rosemary, burdock root, sage, chamomile and more. I have only started to look into herbal rinses, so I decided to purchase a bit of nettle — which I heard is good for aggravated scalps — and some burdock root, which is used to improve scalp conditions, combat hair loss, reverse itching and dandruff. I’m certainly not losing hair, but digging at my scalp can’t be a good thing. The best thing about Noah’s? The herbs were relatively cheap. Because this is the first time I’m entering into the world of herbal rinses, I didn’t want to go crazy and buy up the store. My little bags of herbs costs about $1.50. Nothing to write home about. Cheaper than a ride on the TTC to get there and back to work. Noah’s also has a number of carrier oils: olive, grapeseed, walnut, coconut and more as well as essential oils like lavender, peppermint and tea tree. Of course, they have oodles of mass produced hair and body care products that are made from natural or organic ingredients for those of you who aren’t big on mixing your own stuff. Once I do my herb rinse — maybe this weekend if I have enough time — I’ll let you know what I think. Noah’s will definitely get hit up again for some more herbs, oils and soaps. This sounds , great! I hope you have great results with your herbs, keep us posted. Take care. Can’t wait to hear what you plan to do with all those herbs…what a bargain!